Australia has well-functioning but limited markets for crop insurance. If hail or fire destroys a paddock, for example, an insured farmer will receive a payout for the value of the crop. But multi-peril crop insurance – which covers a wide range of adverse events including drought – has failed to thrive in Australia. The international experience has been similarly uninspiring. Many reviews have attributed these failures to information and participation problems. Firstly, only the riskiest or most drought-prone farms may sign up for insurance (the adverse selection problem). Second, farms with insurance may put less effort into preparing for and managing drought (the moral hazard problem). Both these problems make insurance more costly to provide, resulting in higher premiums and lower uptake. While these problems apply to all forms of insurance, they are particularly acute in agriculture, given the effects of drought will vary widely depending on farm-management decisions and detailed – and difficult to observe – farm characteristics such as the quality of land and livestock. Recently, farmers groups have called for tax breaks to promote multi-peril crop insurance. Unfortunately, while tax incentives and other subsidies may increase uptake, there is no coherent case for providing more than normal tax deductibility. In fact, such subsidies could actually cause economic harm. Insurance premiums provide important signals to farmers, promoting preparedness and adaptation. This includes promoting careful crop-planting decisions when drought risk is high. The inglorious record of farm crop insurance in the United States shows how things can go very wrong when insurance is subsidised. It is not surprising that previous reviews have consistently recommended against insurance subsidies, while just last year the New South Wales government rejected a similar proposal. One alternative, which has been receiving increased attention in recent years, is index-based insurance. Here payouts are based on weather data rather than an assessment of actual farm damages. For example, a farmer might receive a payout if rainfall falls below an agreed threshold. Index-based products are largely immune to the information problems that plague standard insurance: insurers don’t need to spend time and money assessing each application, or monitoring farmers’ behaviour. Instead, insurers must solve the technical problem of designing an accurate index. This index needs to be sensitive to the complex effects of weather on farms. In practice, the effect of a drought depends on many things. The amount of rainfall, its timing, the temperature and many other factors all interplay. If these factors are not taken into account, drought insurance runs into a “basis risk” problem: payouts don’t align with the climate risks faced by individual farms. This basis risk problem is largely why index-based weather insurance products have struggled in Australia to date. 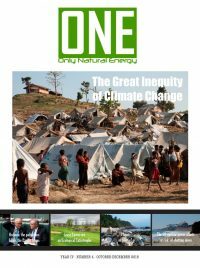 In recent years, governments have focused on promoting private drought insurance markets. However, public schemes are also possible and exist in many other countries. 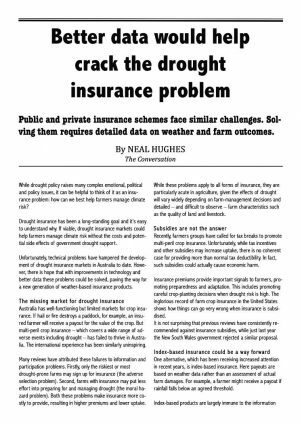 A well-designed public drought insurance scheme – with premiums to cover costs – might have some advantages over private insurance. For example, governments may be better placed to absorb losses in years of severe widespread drought (although re-insurance markets might provide a way for the private sector to manage such risks). However, public drought insurance schemes could, depending on their design, reduce demand for private insurance. This problem also extends to other forms of government drought relief: farmers may be less likely to pay for insurance if they suspect ad hoc drought assistance will be available. Ultimately, public and private insurance schemes face similar technical challenges. Solving these technical issues requires detailed data both on weather and farm outcomes. Numerous reviews have cited data limitations as a key constraint on the Australian farm insurance sector. A recent review by ABS and ABARES highlighted the patchy and fragmented nature of existing government and industry agricultural data. There is a good case for government to support the supply of this data, similar to the National Flood Risk Information Project established following the Australian 2011 floods. Investments in data are likely to have many applications beyond insurance, including the development of improved tools to support farm decision-making. While drought insurance schemes have had mixed success to date, there remains some hope for the future. The emergence of “big data” collected from satellites and internet-enabled devices promises to revolutionise both farm production and risk management. In time, smart products underpinned by better data might finally help us solve the challenge of drought policy.